Walking through downtown Eureka Springs, you’re sure to see shops, hotels and restaurants. You can’t see the rich history of the area, but it’s always there … under your feet, behind shop doors and even above your head. Here’s the history of some of downtown’s most popular spots, courtesy of the Eureka Springs Historical Museum. Entering town on 23 North, it is the first road that greets you and leads you into the busy downtown area. It is truly the backbone of the town. This street is known to many as Main Street, but in the early days it had another name: Mud Street. It runs between the two mountains that form the geographic base of Eureka Springs, East Mountain and West Mountain. It seems to silently support the weight of those mountains and has endured well over a century of transformation. During the settlement era, Main Street was the center of town. The grocery store and post office were along this road, along with many other businesses vital to a growing community. It was called Mud Street because of the muddy conditions created by the run-off of both mountains and overflow from bordering Leatherwood Creek. 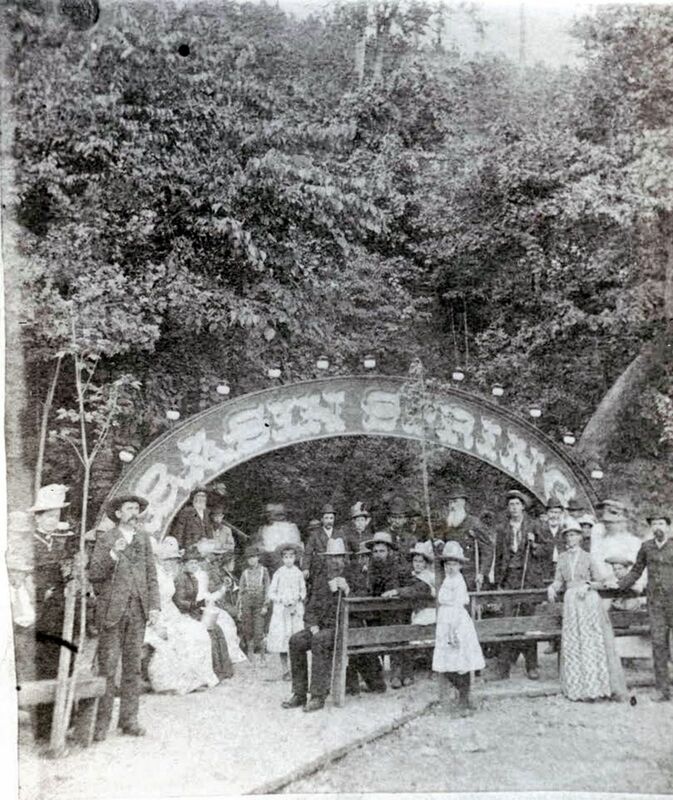 Within six months of the first settlement, the population of Eureka Springs had expanded to a reported 3,000 residents, not counting the estimated 15,000 transient population. By 1882, there were 5,000 people living here, more than double today’s population. The town had boomed virtually overnight. Today, almost all of the original buildings still stand, but their function has changed dramatically. These great pieces of architecture are now occupied by fine eateries, hotels and specialty shops. When entering the city limits of Eureka Springs on North Main Street, have you ever wondered what the skeleton of the old abandoned building, right past Eureka Springs and Northwest Arkansas Railway, once was? In May 1881, electric power was furnished to the town when the Eureka Springs Light and Railway Company constructed the first power plant next to the Railroad Depot. The company also processed and stored block ice, which was delivered to customers all over town. In the 1940s and 1950s, this building also served as the Eureka Ozark Food Corporation, manufacturing “Ozark Bunny Pot Pies.” Rumor has it when Gene Lyon purchased this building in the 1970s there were hundreds of the boxes still remaining, and he made interior walls using the old boxes. The structure is still known as the Ice House today. Although it is only a skeleton with trees and shrubbery growing up, inside and around the building, it provides a beautiful reminder of days gone by. Surely you’ve seen Basin Spring Park, but do you know the history of Basin Spring? It all started in 1956, when Dr. Alvah Jackson was hunting with his son, who began to complain of sore eyes. Having heard the springs have magical properties, Dr. Jackson instructed his son to go down to the hillside near their camp and wash his eyes thoroughly with water. In a few days when the infection began to heal, Dr. Jackson examined the spring more closely and discovered a rock shelf buried under mud and gravel. After cleaning out the basin, he was convinced he had found the legendary spring he had been seeking for years. During the Civil War, Dr. Jackson treated wounded soldiers, both Union and Confederate, in a bluff shelter located near the spring that became known as Dr. Jackson’s Cave Hospital. He continued to treat patients in the area after the war with the spring water and began bottling and selling it as Dr. Jackson’s Eye Water. 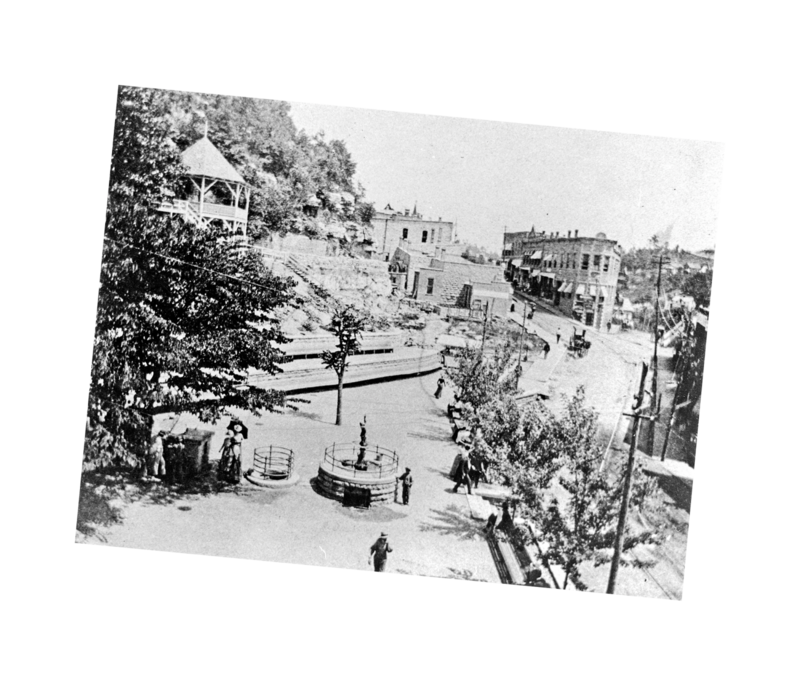 The recorded history of Eureka Springs began in 1879, when Dr. Jackson invited his friend, Judge L.B. Saunders, who was suffering from an “incurable” leg infection, to bathe it in the curative waters of the spring. Saunders’ leg miraculously healed. Over the years, Eureka Springs has experienced the devastation of fire many, many times, but none were as serious as those between 1883 and 1893, when four major fires ravaged the fledgling town. On a cold November night in 1883, fire consumed 75 structures in a five-acre area. This fire began at the foot of Mountain Street and burned up both sides of that street and Eureka Street. The origin was considered to be arson, as it began in a business building which was the object of a bitter dispute between father and son. The wooden shacks clustered together on the hillside caught fire one after another. The local bucket brigade arrived and tried to contain the fire but could do little to help with the poor equipment and the small number of volunteers at hand. A second fire, even more deadly in its destructive force, swept through a part of town in 1888. It began at the Hancock House near Sweet Spring. 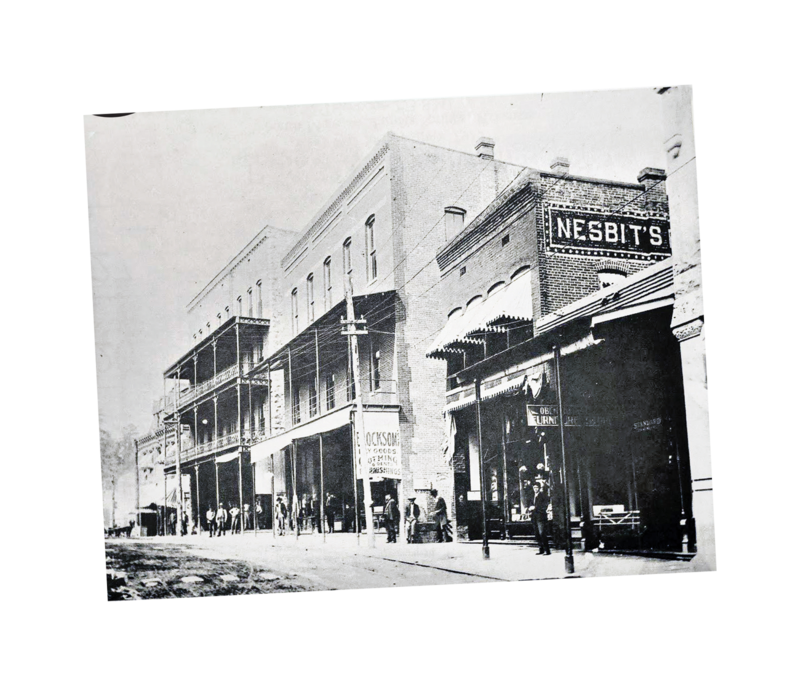 The small hotel was burned to the ground, as well as every building on Spring Street all the way to the Perry House, where the Basin Park Hotel now sits. The next destructive fire was that of the 60-room Perry House in 1890. The fire swept across Spring Street and down the hill, burning the original Grand Central Hotel and every building between the two. The fire spread from one building to another until everything in the south area to the junction of Main and Spring was consumed. In 1893, a fourth fire began at the intersection of Spring and Main Streets and destroyed the entire block of Main Street, ending at Calif House, where the Eureka Springs Historical Museum is now located. Fifty structures were destroyed, including the Western Hotel. With the near completion of a water system in 1894, the citizens banded together in an effort to purchase apparatus for the fire department. By December of that year, they raised $1,000 to purchase hoses. The water system began operating on April 5, 1895, and 18 days later the first company of the Municipal Fire Department was organized.